Who can forget Peter’s magnificent win in Richmond – he picked his moment, the peloton missed it and they never saw him again until it was done and dusted. Here are the last 5km of that race to enjoy again! Not only did he win with panache, but he celebrated at the finish with aplomb. Not content to just give the victory salute, he got off his bike and started walking back into the peloton as they arrived at the finish, where delighted riders high-fived him. I *so love* that! He was a popular win with the fans *and* the peloton. Chapeau! Sagan was certainly maturing as a rider but he was also maturing as a man. In November, he exchanged his champion’s jersey for a wedding coat that made him look like a character out of Tolstoy. One thing is for sure, Peter and Katarina’s children are going to have fantastic hair! Peter started the season with a couple seconds – before he got to the top step in the spring, he would rack up eight second places since Richmond. He was 2nd in Omloop, in Tirreno-Adriatico (losing by 1 second to Greg Van Avermaet) but picked up the points jersey, and was 2nd in E3 Harelbeke. But all the naysayers – I’m lookin’ at you, Oleg – had to eat their words when Sagan hit the jackpot with a first in Gent-Wevelgem, the first time a reigning world champion had won this race since 1962. Pictured below, congratulations from Tom Boonen on Peter’s GW victory. He also finally got the monkey off his back – or should we say the Monument off his back – by breaking away in the last 14kms to solo to the finish line at the Tour of Flanders. 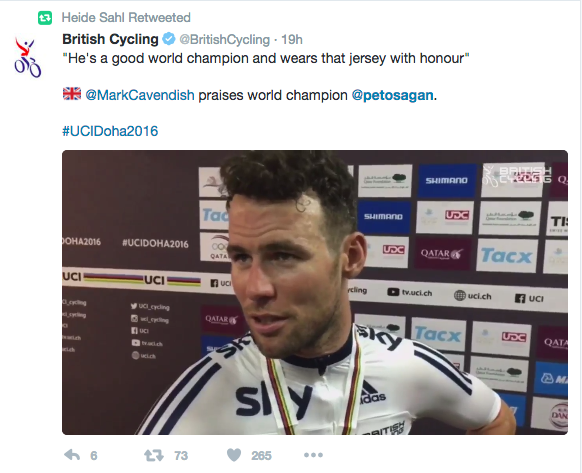 He basically did a Cancellara on Fabian Cancellara himself, who came in second in the final Flanders of his career. It truly felt as though the torch was passed on that day (pictured below). His season end was as eventful as the beginning of his season, winning the European Road Race Champion (stars above!!!) 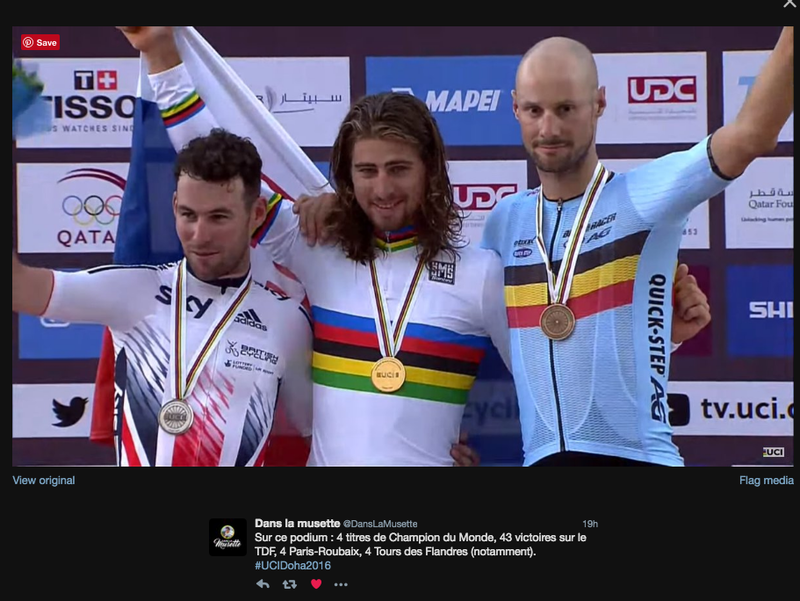 and the GP de Quebec (with a 2nd in GP de Montreal) before going to Doha to reclaim the rainbow stripes, and ending the year at the top of the World Tour with 669 points (609 pts for Quintana, 564 for Froome). 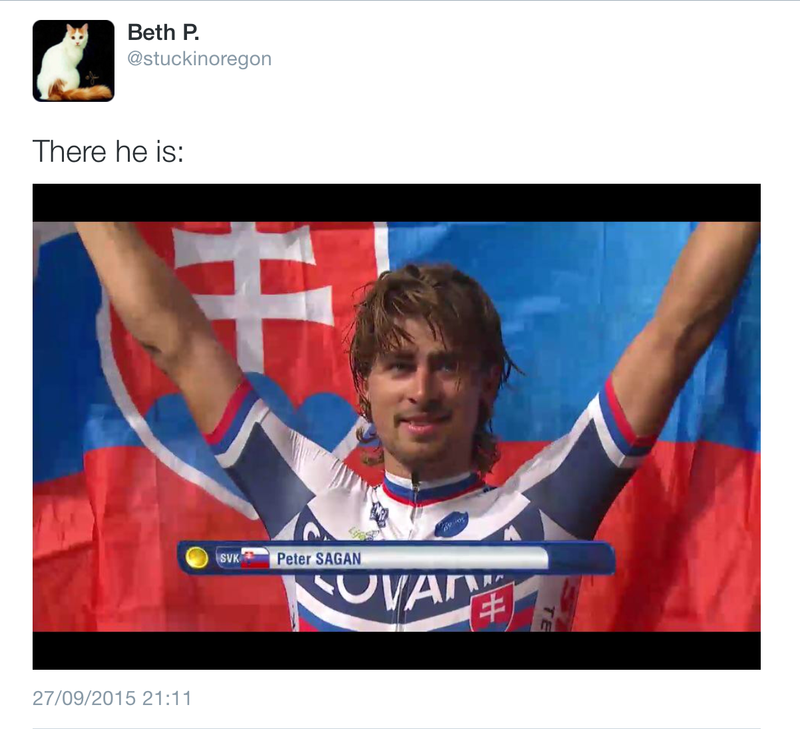 One wonders how he’s going to top this year but, knowing Sagan, 2017 will be better than ever. Next PostVeloVoices Podcast 96: Doh! Worlds in Doha? 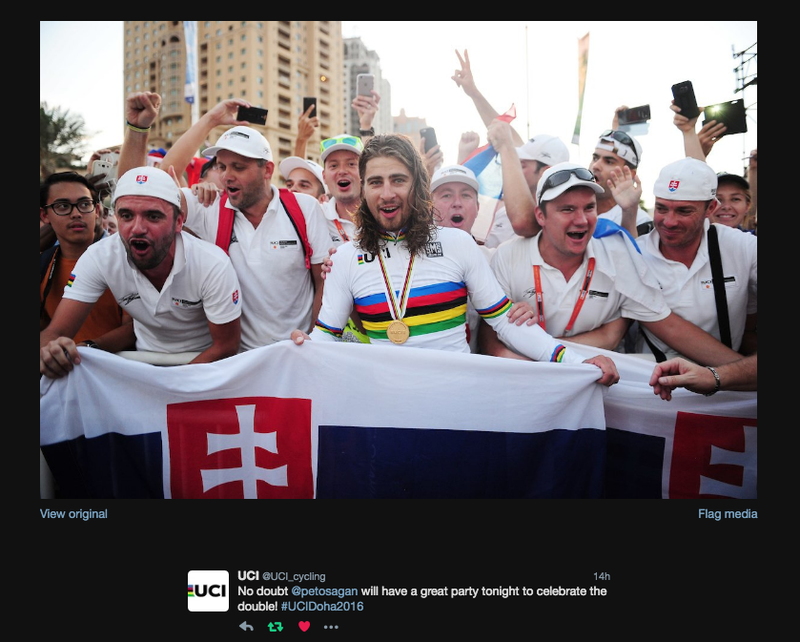 Chapeau Sagan! 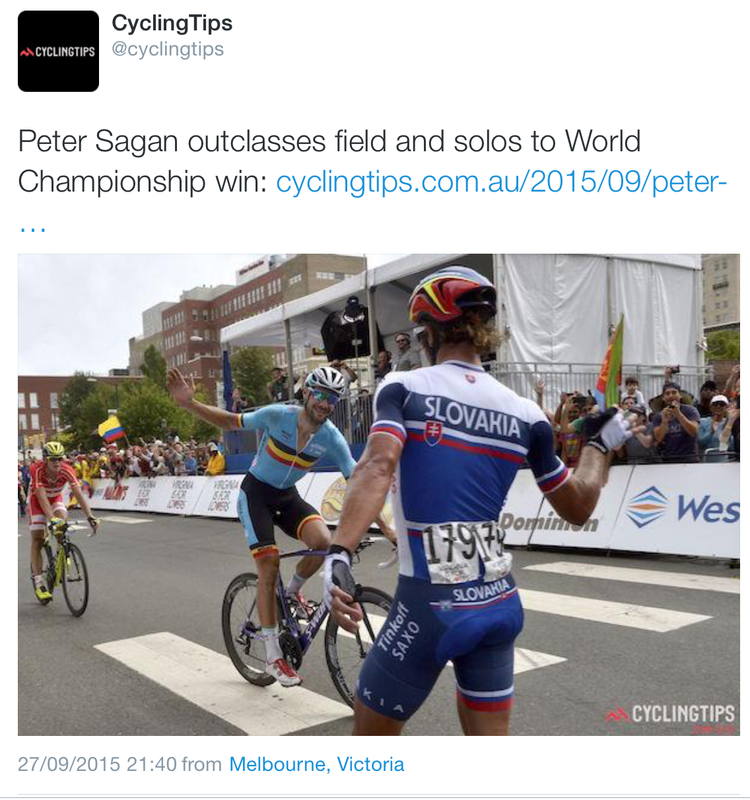 Can’t decide who is better off for his win, Sagan… or cycling.